C. K. Raju’s Blog » Blog Archive » Goodbye Euclid! Of course Needham studied the scientific revolution, and not the industrial revolution. The questioner was afraid to use the right term, since I have already shown that the Copernican revolution and the Newtonian revolution are bogus. Consider the situation reciprocally. If one centre on China and one studying Eastern philosophy are adequate (and these studies would be required for strategic reasons as well), then let us purge all western philosophy and history from our syllabi, and restrict its study to one centre per country. Finally, if history can be useful even if false, we should strike down the laws on defamation, for anyone could defame anyone else, and then claim that falsehoods could be useful! 1. “Towards Equity in Math Education 1. Good-Bye Euclid!”, Bharatiya Samajik Chintan 7 (4) (New Series) (2009) pp. 255–264. http://ckraju.net/papers/MathEducation1Euclid.pdf. 2. “Teaching racist history”, Indian Journal of Secularism 11(4) (2008) 25-28. 3. A newspaper article on this in Hindi, in Jansatta 23 Jan 2008, ed. 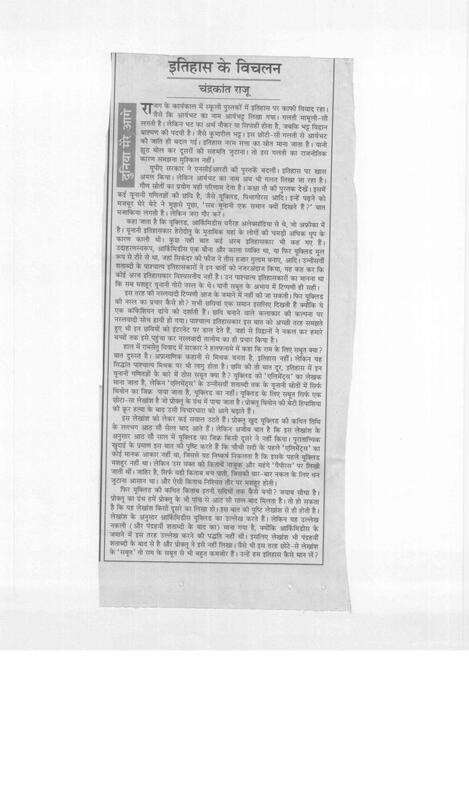 page, at http://ckraju.net/papers/Jansatta-Euclid.jpg. This entry was posted on Monday, August 15th, 2011 at 12:21 am	and is filed under Education, History and Philosophy of Mathematics. You can follow any responses to this entry through the RSS 2.0 feed. You can leave a response, or trackback from your own site.